All I can think of now, is bears and hybernation. One – I am sleepy right now. Two – this space will go into hibernation for the most of the coming two weeks. Don’t worry if I come back here anxious, worried and low spirited for the next Blogging Marathon – that would just be the effect of my son’s vacation on me. Its going to be half day school from coming Monday. Its almost like preparing the parents for the impending doom – full day vacation – which starts a week after that. I always have a suspicion that teachers do a jig after the kids leave the school premises on the last working day. Can’t blame them, though! And so the countdown to keeping myself sane is just less than 15 days. Cannot imagine keeping a five year old engaged for 24 hours a day, for TWO whole months. Oh God! Wish me luck everyone! Easy meals are going to be part of the menu then. Like this oatmeal here. Cooked in the microwave. But that 2-3 tablespoons of pumpkin purée and a dash of cinnamon and ground ginger, makes all the difference. Try this whole grain dish for yourself, when you need a change from the usual. Or like in my case, you have a lot of pumpkin purée left over after making those melt in the mouth pancakes. 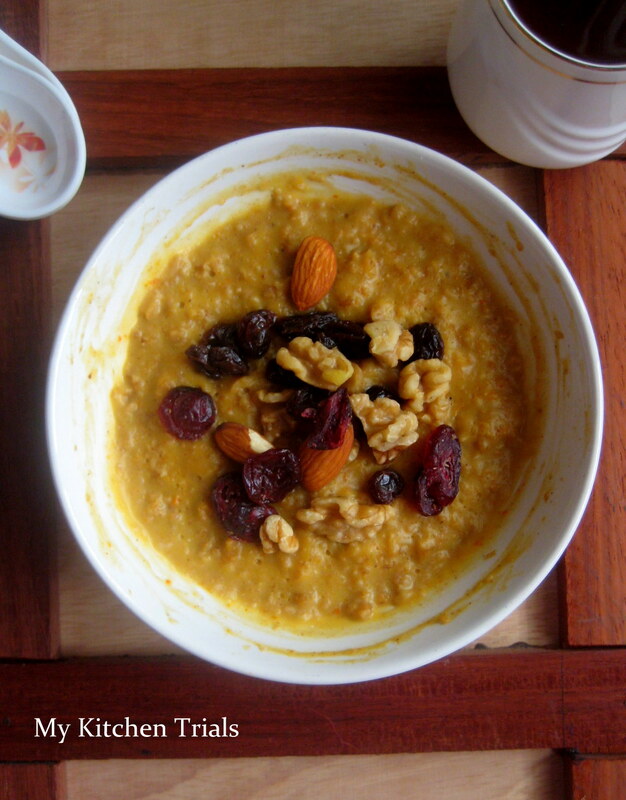 Mix everything , except the dry fruits, together and microwave for about 2 minutes. Mix and microwave for a furthur minute or until the desired consistency is required. Top with raisins, walnuts, dried cranberries and almonds and serve. You might have to adjust the liquid propotion a bit to get the preferred consistency. Serves one. Should we really shop, for food props? The picture looks so stunning!..would never have thought such simple ingredients can make a beautiful picture..yea ya I know its in the hands of the person taking it..:)..you have all my sympathies..my woes will start a little later..and I have no clue what I will do with them wanting to play play with whatever they get on! And forgot to say I really enjoyed your visual treats this round! It may be not cold enough in Spain to eat this oatmel here but it looks great! Think of all the fun things you can do with your son during his vacations……enjoy his little mischiefs…..he’ll grow out of it sooner than you can say VACATION. The pic looks very vibrant and colourful. beautiful picture ..such a humble breakfast and yet a stunning picture!! Gorgeous Breakfast dish! Yet another recipe that is getting bookmarked. The problem with too many bookmarking is that I tend to forget…Gosh I definitely should give this a try. It looks so healthy and all. 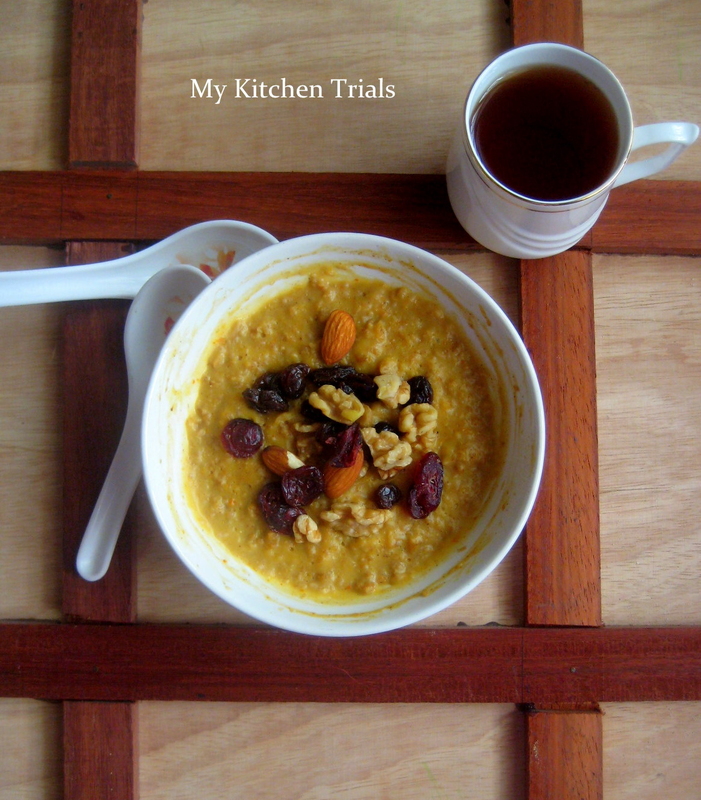 OMG…so creative – I love oatmeal..I love pumpkin…a musty try recipe! The oatmeal looks coloful and scrumptious. wow…u done this perfectly. n the pics r very clean n cool.. Same pinch! !Lil Angel too has 2 whole months vacation and I have put her in a summer camp activities for half a day,so I am a bit ok now and she is enjoying her time there:).